I’ll start this review by giving you details regarding the Candlelight Processional dining package. 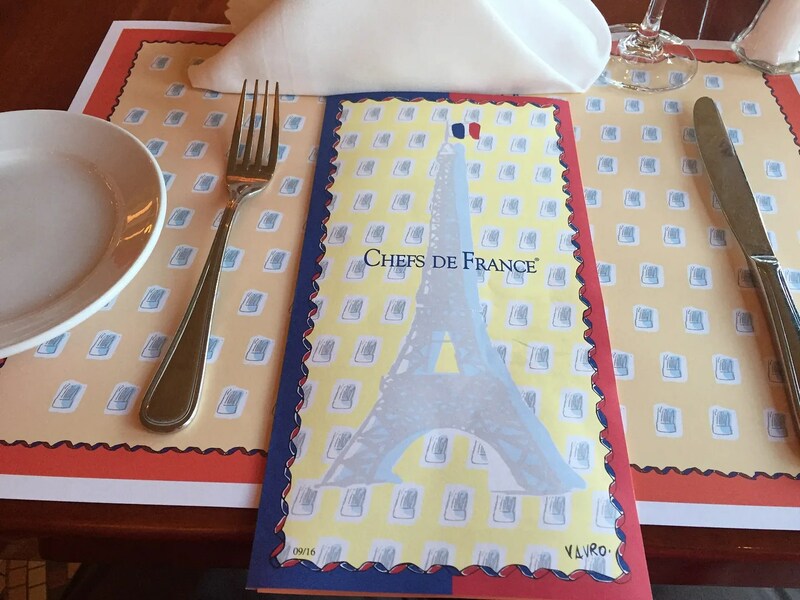 However, if you are only here to read about the food at Chefs de France, then feel free to scroll past all of the CP information until you get to the Chefs’ place setting/menu, which is where my Chefs de France dinner review begins. 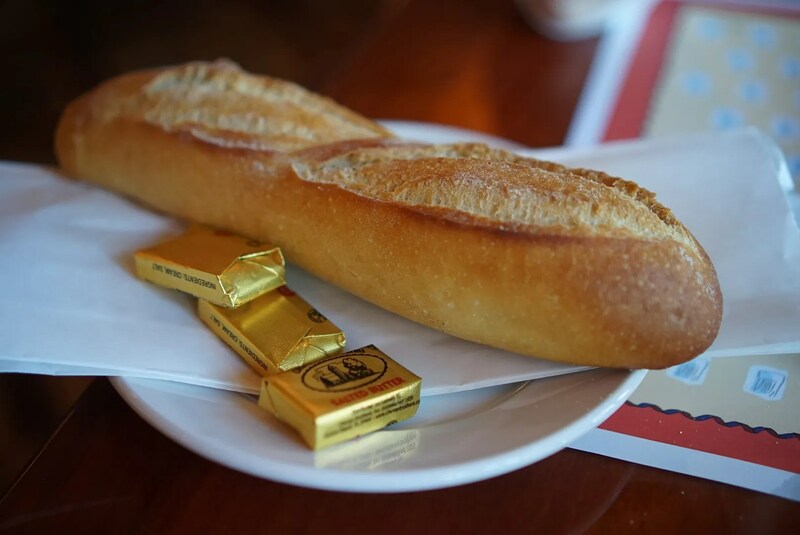 The Candlelight Processional dining packages allow you to enjoy a meal at one of Epcot’s restaurants (or breakfast at a few other restaurants located at the Epcot resorts) , while guaranteeing you a seat for the show. While you do not have an actual assigned seat, those with Dinner Package badges are the first to be allowed in to the American Gardens Theater for their chosen show so have first choice of seats. (Any remaining seats are then made available to the park guests waiting in the stand-by line). 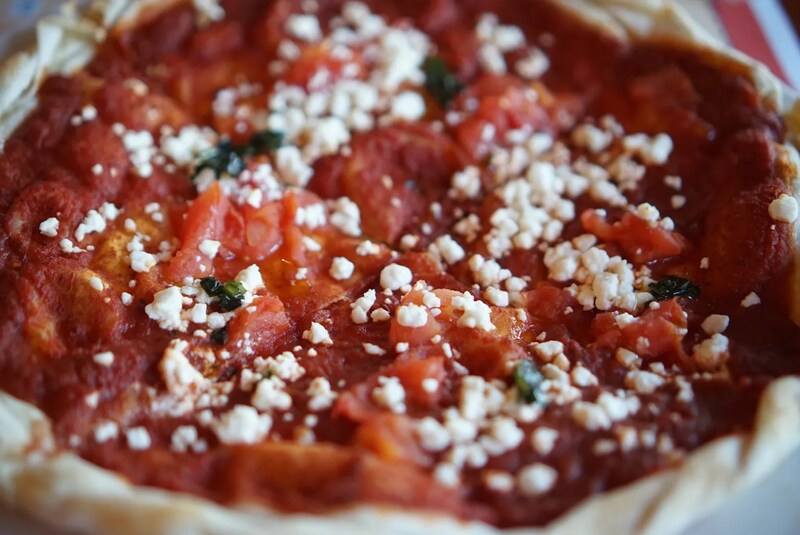 This package includes choice of appetizer, entree, dessert, and non-alcoholic, non-specialty beverage OR 1 buffet. 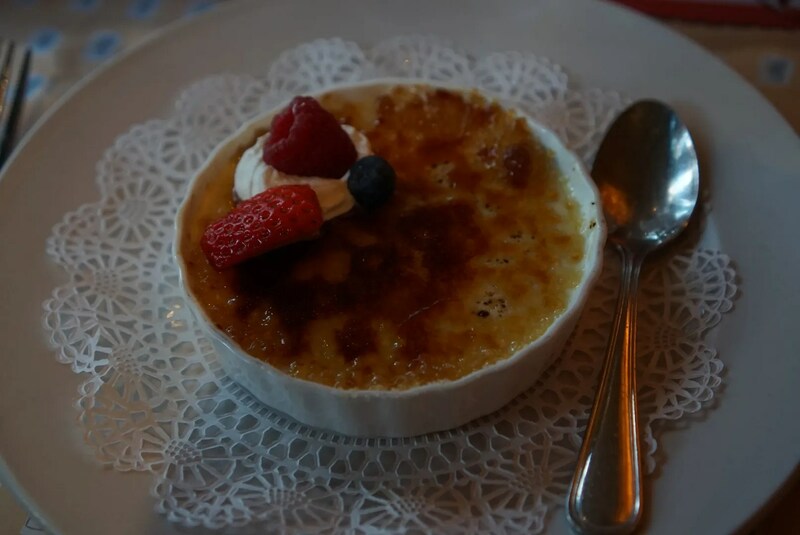 The 2016 Candlelight Dining Packages for breakfast ranged in price from $27 for the Boardwalk’s Trattoria al Forno (Note: this was before it had character dining) to $54 for Epcot’s Akershus. 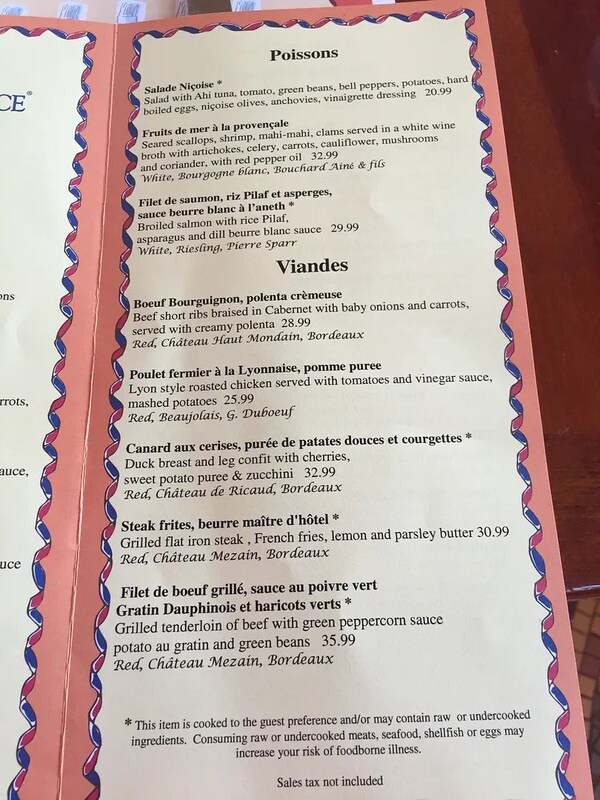 Lunch prices ranged from $39 for Epcot’s Biergarten to $69 for both Akershus and Coral Reef at Epcot. Dinner prices were even higher, starting at $51 for Epcot’s Nine Dragons to as much as $76.50 at Epcot’s La Hacienda de San Angel. These prices are for anyone over the age of 9 and do not include tax and gratuity. Children’s prices (ages 3-9) for the various meals range from $14 – $41. Reservations can be made online (but you need to make sure you do this on the Disney World website page which is specifically for the Candlelight Dining Package) or by calling 407-WDW-DINE. This is a reminder for your upcoming dining reservation. Please see below for details. NOTE: The Candlelight Dining Package will be paid for at the individual restaurant where you choose to dine. You will then receive your Candlelight Processional show badges at the restaurant for guaranteed seating at the American Gardens Theater for the booked show time. So why did I choose Chefs de France, especially since at $75.99 for dinner it was one of the more expensive packages? My answer is that my son is a picky eater. 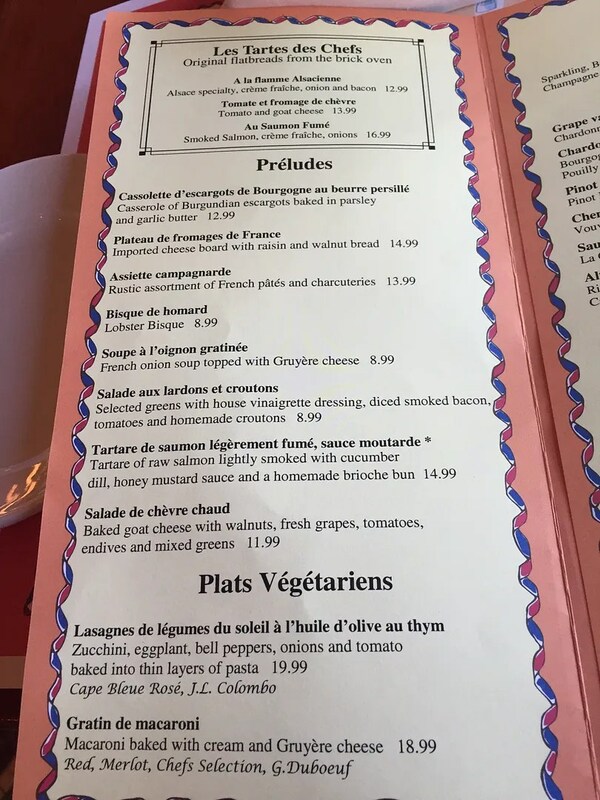 In looking at the menus for the various restaurant options, there were few which had something that I thought he would enjoy for each of the three courses which are included with this package. Chefs de France seemed to be one of the few that would work for him, so I decided it would be worth paying the extra $ if he would eat and enjoy the food there. So was my strategy correct? Was it worth it? Read on to find out. These are always very good here. My son (the bread lover) especially enjoyed his baguette and requested and received a second one. 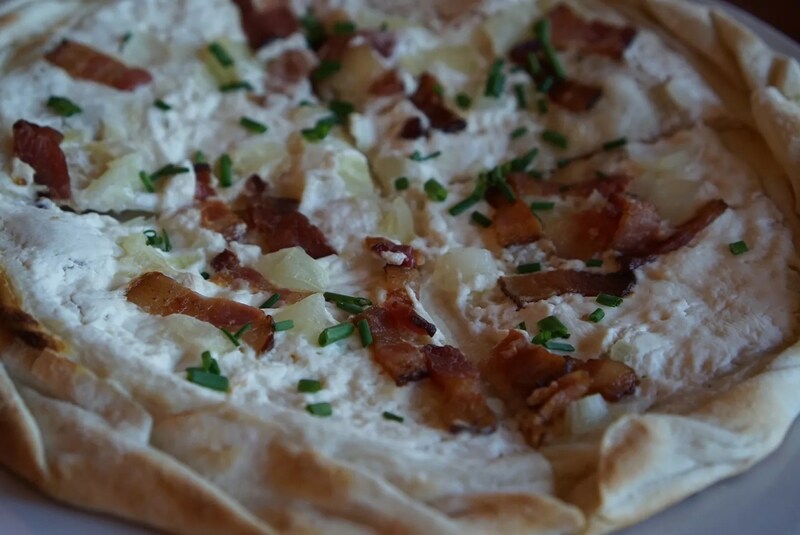 While we liked both of these, the bacon and onion one was our favorite. It was excellent! It had been many years (at least 10) since I had had this and had forgotten how good this flatbread is. 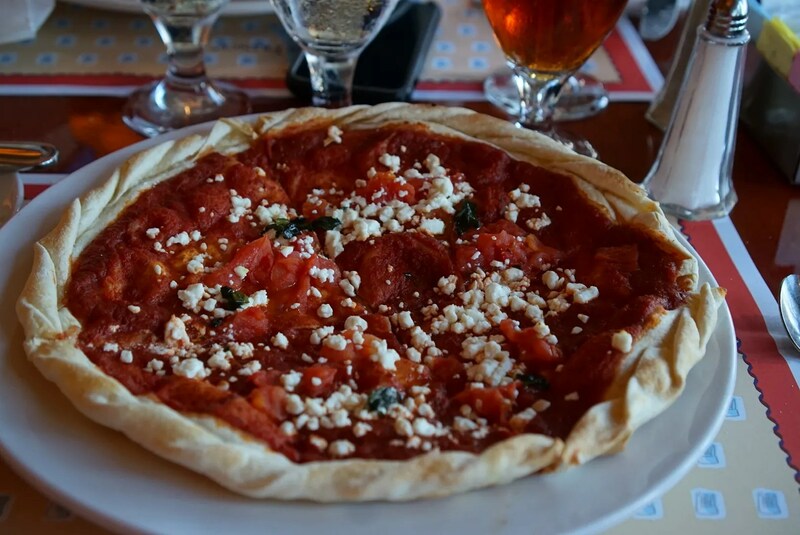 My last visit to Chefs was in December 2013 and I was also dining with the CP package. 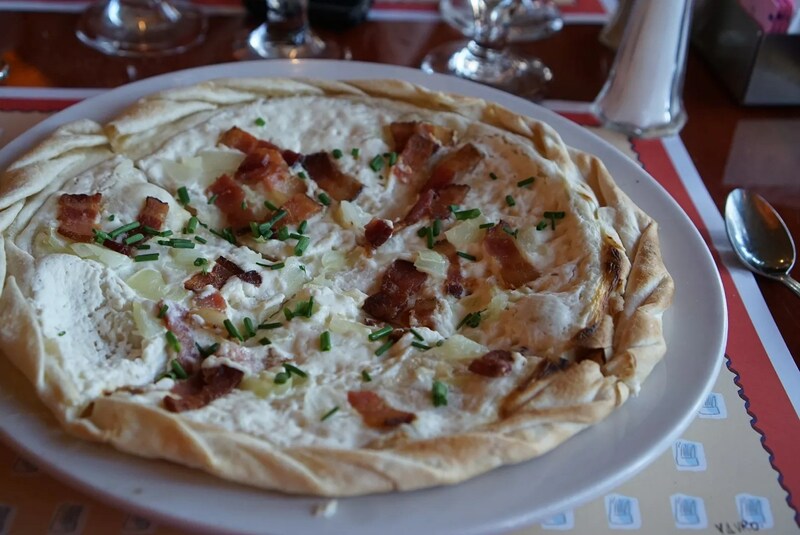 Unfortunately I chose the French Onion soup for my appetizer, which IMO was not nearly as good as the bacon and onion flatbread. 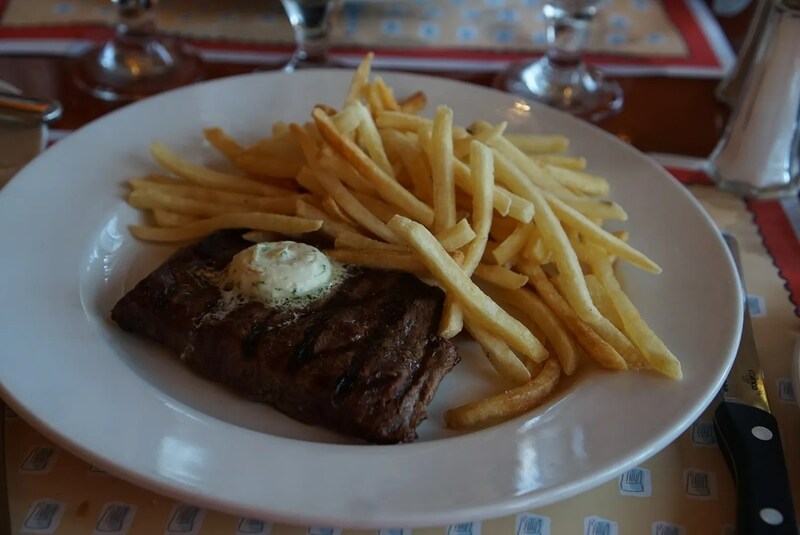 While my steak was pretty good, the french fries were not. They tasted like they had sat under a warmer for awhile. Even my son (who loves fries) would not eat these. As for the steak though, it was better than I was expecting. 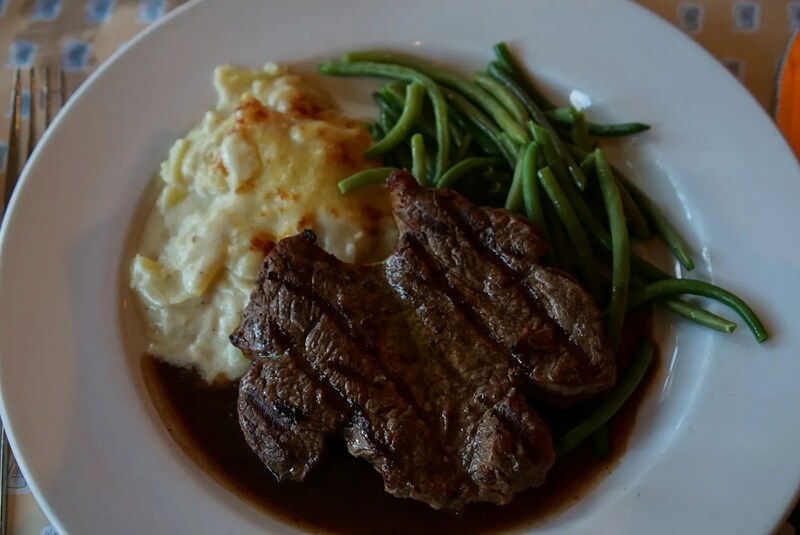 I normally always choose the filet when ordering steak at a restaurant but that is what my son wanted. 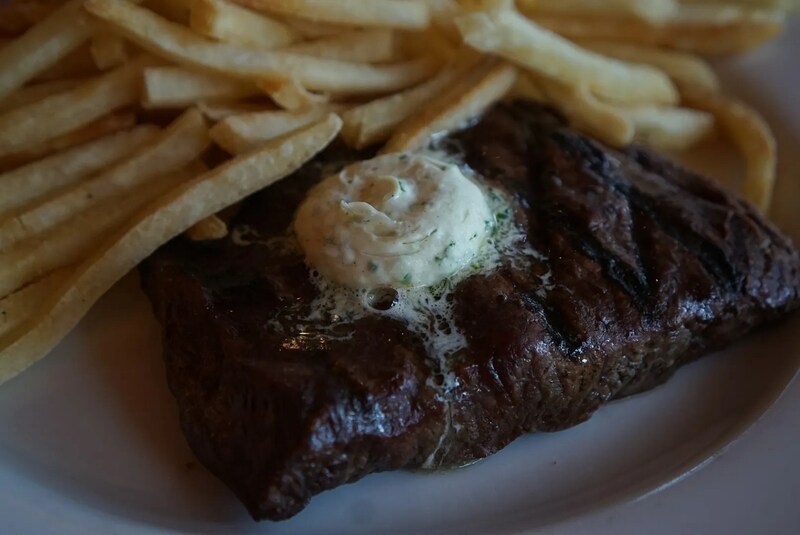 So for the sake of more variety for this review I went with the flat iron steak, even though I was afraid it might be tough. 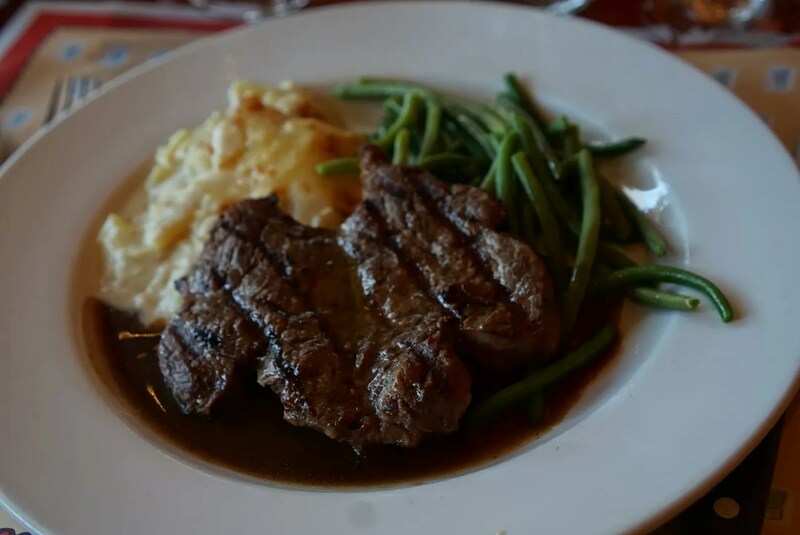 But, while this wasn’t the most tender and flavorful steak I’ve ever had, it was a bit better than average. 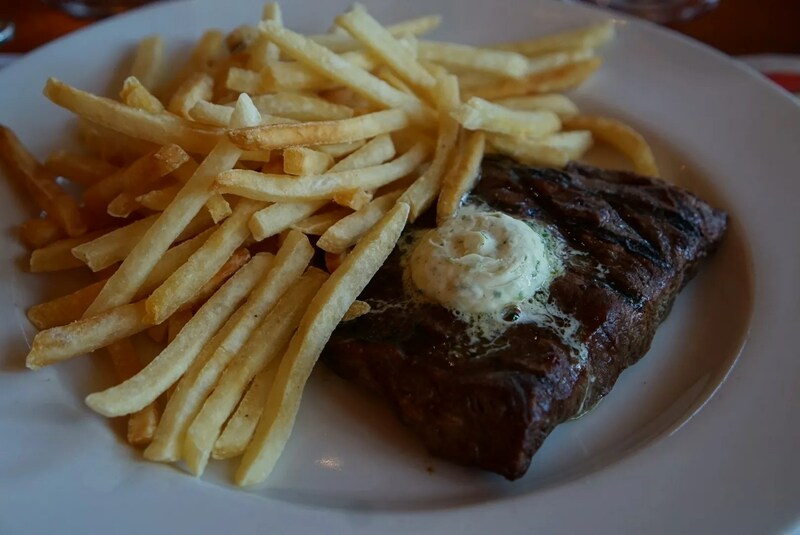 He said his steak was very good and the potatoes were much better than my french fries. He doesn’t eat plain green beans though so those went untouched. 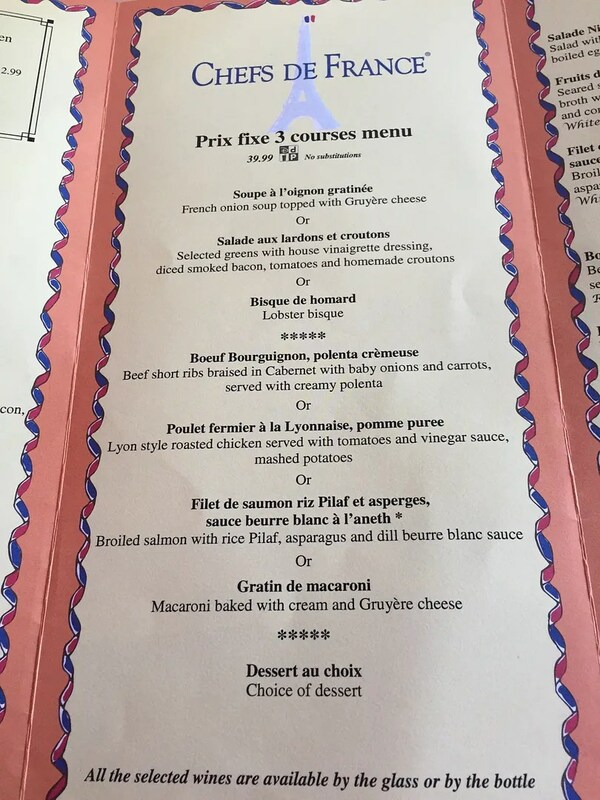 As you may have noticed, this was the most expensive entree on their menu so if you are eating here using Dining Plan credits (or the Dinner Package like we were), then you will get the most bang for your buck if you order the filet…and according to my son, it’s very good. 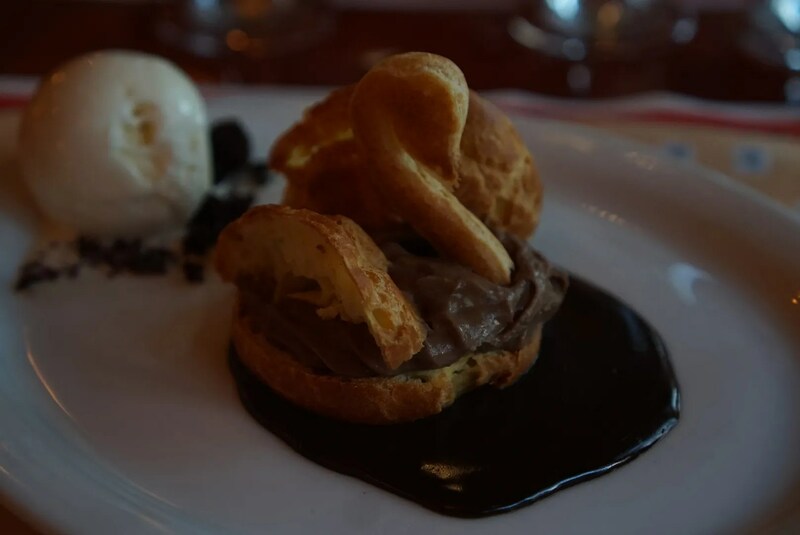 Their dessert menu was another reason why I chose Chefs de France for our CP dinner package. 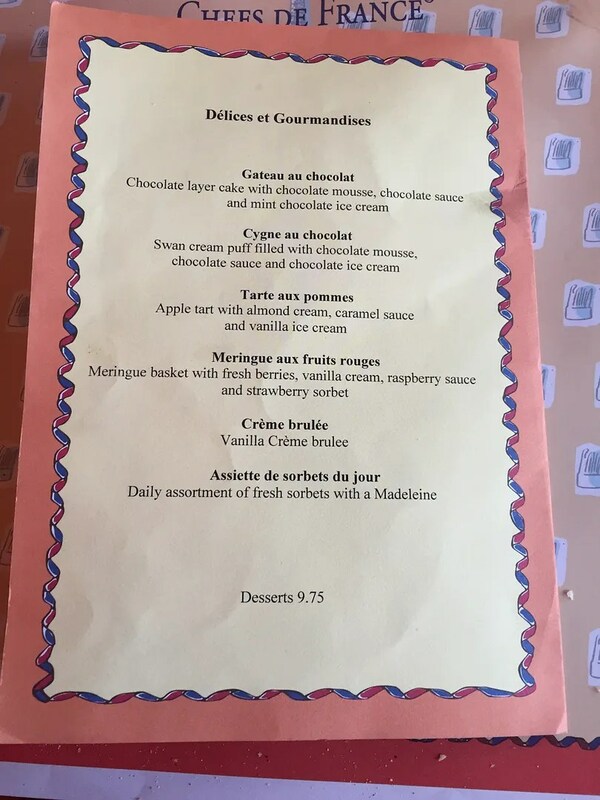 All of these dessert choices were appealing to me and most appealed to my picky son too. Note: Both of our desserts (as well as all of the others on the Chef’s dessert menu) were $9.75. We both enjoyed our desserts. 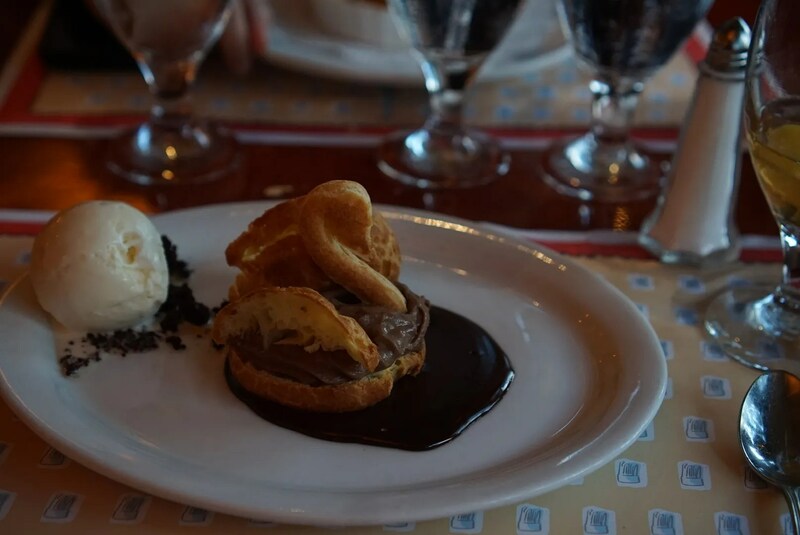 I was glad that I had substituted the vanilla ice cream for the chocolate, as I think with the chocolate mousse and chocolate sauce this dessert had plenty of chocolate. Now let’s do a price comparison of the Out of pocket cost of our meal vs. the Candlelight Package price. The OOP cost of my meal would have been $56.72. I paid $75.99. Therefore I paid $19.27 for the privilege of having a guaranteed seat at the Candlelight Processional show. The OOP cost of my son’s meal would have been $62.72 ($1.00 less than the highest possible) and again I paid $75.99. So for his seat at the show I paid $13.27, or an average of $16.27 each for the two of us. So seeing the numbers now, I would have to say that the Chef’s package is a little bit overpriced. However, given the fact that we enjoyed our meal (with the exception of my french fries) I would not complain. If though we had paid $75.99 for a bad meal, you would be hearing all kinds of complaints from me. And that just leaves the ratings. Our rating for this meal would be 4 1/2 stars (deducting 1/2 star for the really bad fries). This is much better than the 3 1/2 star rating given to Chefs by Yelp reviewers and a little better than the 4 stars from Trip Advisor. Also Trip Advisor ranked Chefs de France #141 best restaurant (of nearly 3,000) in the Orlando area and #52 best Disney World restaurant.